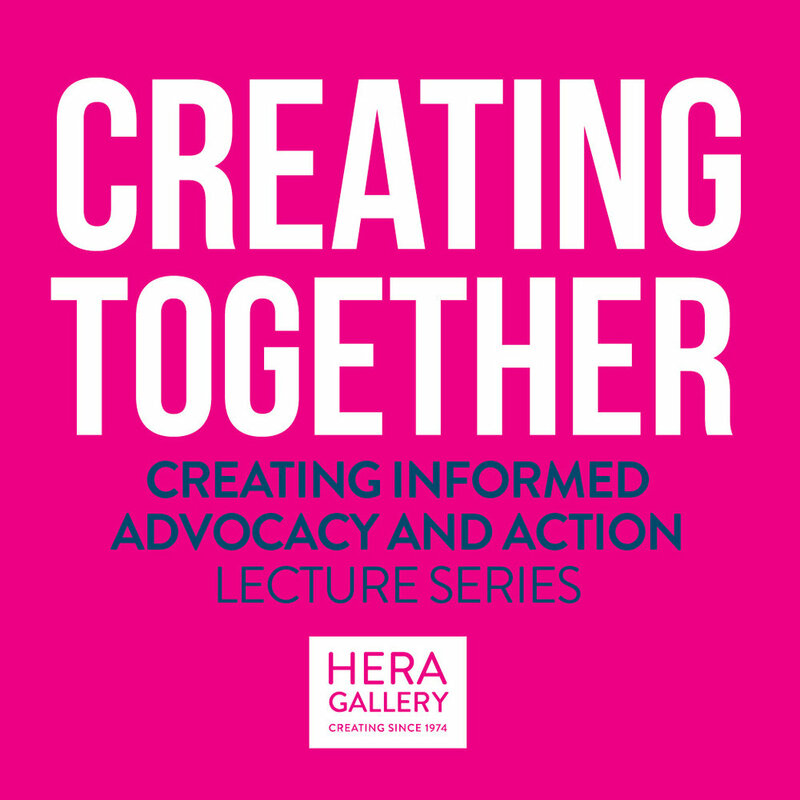 Hera Gallery is pleased to announce the second year of CREATING TOGETHER lectures. The issues chosen related to relevant issues directly effecting Rhode Islanders and beyond. 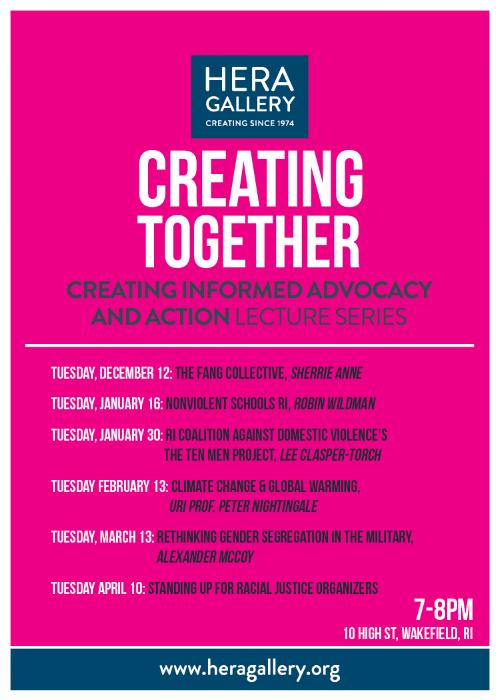 Each lecture events will be held at the gallery as well as a live streamed on Facebook. If you miss it, the recording will be shared on the Hera Gallery Facebook page afterwards. Steven Brown from the ACLU will be discussing where we stand now in RI regarding some of our concerns related to women's and immigrant and workers rights, etc. He will discuss the recent bills that failed and passed, especially the ones regarding immigration and reproductive rights. Donations will be given to ACLU of RI. We are asking for a suggested donation of $10.00. These events will be held at the gallery and as a live Facebook event. If you miss it, the recording will be shared on the Hera Gallery Facebook page afterwards. Gabriela Domenzain from the Roger Williams University Latino Policy Institute will be discussing Latinos in RI, DACA and the status of "Dreamers" in RI. Sherrie Anne from the FANG Collective ( Fight Against Natural Gas)will discuss FANG, their involvement in Standing Rock, various environmental issues that FANG is involved in such as LNG), how FANG engages communities of color, etc. she is sending me a write up. Donations will go directly to the Fang Collective. Robin is a Level 3 Kingian Nonviolence Trainer. After meeting Bernard LaFayette, Jr. in 2001, she has dedicated her professional and personal life to practicing and teaching Kingian Nonviolence. Her 27 years as a public school teacher has given her the platform to train educators, administrators, and students in Kingian Nonviolence. Because of the training, school staff and students have reported experiencing profound transformation in the way they address conflict. Robin has conducted Nonviolence workshops, given lectures, and is the author of a Kingian Nonviolence curriculum, used internationally by educators and trainers of young people. Donations will go directly to the Nonviolent Schools RI. Ten Men is made up of Rhode Island men from diverse walks of life who share a common vision — a world without domestic violence. While most men do not and would never use violence in their relationships, many men remain silent in the face of other men's violence because they do not know what to do or how to help. 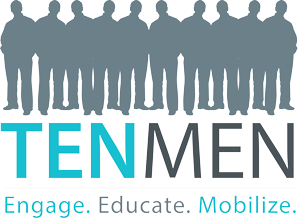 Ten Men is committed to breaking that silence. For more information or to find out how you can get involved, contact tenmen@ricadv.org. Donations will go directly to the Ten Men Project. In an interview with the Dartmouth Radical, Chris Hedges made the comment: "There is no way in the American political system to vote against the interest of Goldman Sachs. It's impossible. Or Exxon Mobil." If you agree with that, what then can you do? Civil resistance is a possibility that fits perfectly with the reality that many of the most important changes of the American system have come through movements that within the formal confines our "democracy" were and remained non-entities. The talk will explore the possibilities this raises, and will engage the audience in a short nonviolence-training exercise. Under a government which imprisons unjustly, the true place for a just man is also a prison. Coming off the success of his Ted Talk on Gender Segregation in the Military, Alexander McCoy will speak on the topic in further detail as well as the not-for-profit group, Common Defense. Common Defense is a diverse, grassroots organization of U.S. veterans and military family members who are fighting to preserve the core values we swore to uphold and defend. Together we vow to protect our communities from hate and violence, to serve on the front lines for social, economic, and environmental justice, and to champion a truly equitable and representative democracy. Donations will go directly to Common Defense.